The New York Rangers finally figured out how to score on the power play, and their two extra man tallies would keep the Washington Capitals in a perpetual state of playing from behind as they drop game three at Madison Square Garden 4-3. The Rangers avoid the deadly 0 and 3 series drop and crawl back into the series trailing the Capitals 2 games to one. The once mighty Capitals' penalty kill was humbled when they were whistled for six infractions. The Rangers were credited for only one power play goal as Brian Boyle's snapper was deemed after Joel Ward had left the penalty box, but the Capitals could not get their momentum going in any real tangible direction after constantly coming back from being a man down. Nick Backstrom, Mike Green and Jack Hillen scored goals for the Capitals. Backstrom got the scoring off and gave the Capitals an early 1-0 lead just 4:06 into the first period. He deflected down a high shot from John Carlson that beat Henrik Lundqvist beneath his pads. 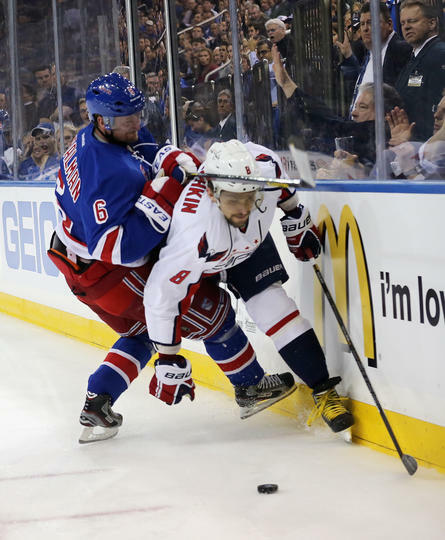 The Capitals' penalty woes started to take effect when Ward took a high sticking call and Boyle scored his first of the post season just as the penalty had expired. The Rangers took the lead when Braden Holtby tripped up Rick Nash and Derick Brassard made the goaltender pay for his transgression. The Capitals did manage to tie the game up. Green's goal was off of sort of broken play. Mathieu Perreault corralled the puck and threw it back to Green open on the point. With the bodies in front of the net, Lundqvist was screened on the shot and the Caps' defenseman picked the top corner for his second goal of the series. Even with that huge goal, the Caps just seemed out of sync. The Rangers took advantage of some pretty shoddy coverage by their visiting foes when Brassard dug the puck out of the corner and threw it in front of the net. Arron Asham crashing the slot, buried home his first goal of the playoffs. Still, the Capitals found a way to march back into the game. Off of an offensive zone face off, the puck skittered back to Hillen who shot a laser toward the net. Whether it had been deflected or not, the puck fooled Lundqvist who was in a rare awkward butterfly. Again, the Capitals tie up the game, and again the Ranger's forecheck exploited poor coverage when Derek Stepan tipped a shot/pass by Rick Nash as the Blue Shirts go up for good. Alex Ovechkin drew a late third period penalty, but even 6 on 4, the Rangers clogged the middle of the ice and the game ended with out a single shot on net by the Capitals in the waning minutes. With Rangers falling into the shooting lanes, the Caps power play personnel tried to pass around it. It took too much time and game three falls into the hands of the New York Rangers. Holtby played great at times, other times he was a victim of sloppy defensive zone coverage. He allowed 4 goals on 30 shots. He didn't help his cause much when he was whistled for the tripping call on Nash. The Rangers made an effort to be more in Holtby's face, just like Boston tried to do last spring. Holtby again will have to fight through it as his Capitals look to get back on track for game 4. Coach Adam Oates and his staff sat down and watched the last Capitals' power play before they addressed the media. Whether it was something they saw, or something they will work on for game 4. Ovechkin was held with out a point for the first time in seven games. A non-factor on the score sheet, but he did draw the late penalty in the third period. Of the seven goal scorers, only Mike Green has scored his second goal of the this series. All of the other players, Derek Brassard, Nick Backstrom, Jack Hillen, Brian Boyle, Derek Stepan and Arron Asham scored their first goals of the series.